For the TU-30, BOSS took their popular TU-80 tuner/metronome and shrunk it to an uber-compact size. 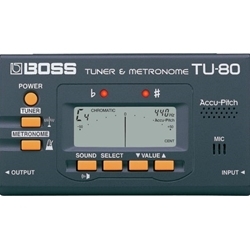 All of the TU-80's main features have been ported over, including BOSS's reliable Accu-Pitch, which sounds a tone when you've reached the correct pitch, as well as numerous tuning modes and rhythm patterns, and the handy Reference Tone Play function. And thanks to its chromatic and flat tuning capabilities, the TU-30 can tune just about any instrument from guitars and basses to strings, brass and woodwinds. The BOSS TU-30 metronome/tuner belongs in every musician's practice room.